Established in 1890 and located in Uruguay, Zenda Leather is a world leader in the manufacture of leather for upholstery of the highest quality. With offices in Argentina, Mexico, the USA, South Africa and Uruguay, the company needed a presentation system for their sales division that was consistent with their high-end brand and uniform across all the global markets they serve. Specifically, they needed an elegant way for over 100 sales people around the world to present documents and material swatches. The product needed to be branded with their identity, it had to hold three-dimensional objects (swatch-sets), it had to be super durable, and it had to have a window through which a brochure could be displayed. 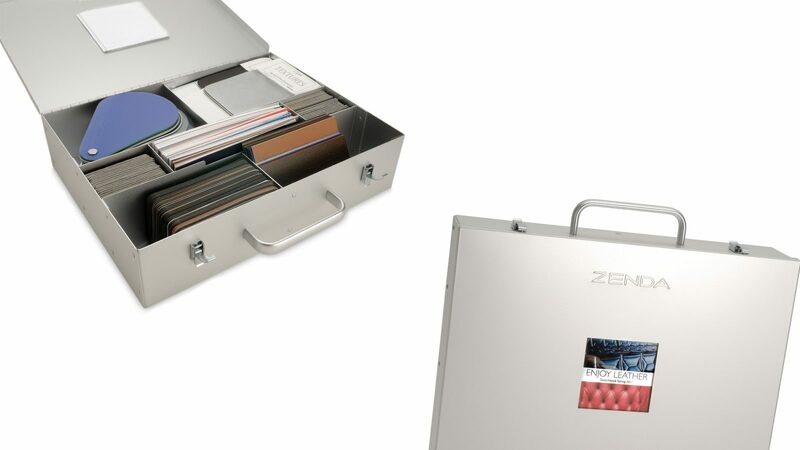 The solution which we proposed and Zenda adopted is a custom aluminum case with internal walls to hold the swatch-sets and collateral. The case has a hardened finish to minimize scratching and a stamped logo for a striking look. A polycarbonate window in the front panel allows for a view of the brochure inside the case. Simple, refined and effective – that was the objective, and that is what we achieved.